Drive a 4x4 off road in Kent and enjoy a magnificent 300 acre farm, powerful 4x4 vehicles and expert BORDA trained instructors. Off Road Driving is one of the most rewarding driving experiences out there, and this off road 4x4 experience in Kent is as rewarding as they come! The slow and steady challenge of successfully navigating a course packed full of tricky surfaces and troublesome obstacles can be as exciting as the fastest of sports car rides. 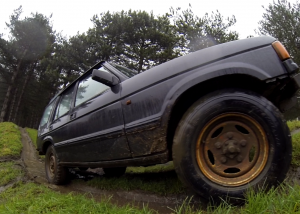 Steep inclines and muddy mounds are aplenty in this 300 acre 4x4 driving site in Kent, and with the expert tuition on hand from the BORDA qualified instructors - you'll be learning the skills and techniques to successfully manage your way around the ever-changing course. With advice and practical demonstrations from the instructors, you'll be learning what separates 4x4 driving from its road going counterparts - understanding the theory behind the burly beast capable of nearly anything off road!Your 4x4 Driving Experience Kent will begin with a welcome and introductory brief, where you'll be shown the vehicle, grounds and instructor that will form the basis of your 4x4 experience. Once briefed (including axle differentiation and how four wheel drive works) - you'll be ready to begin the driving, with some instructor driven demonstrations - before you get behind the wheel yourself and attempt all of the tricks and manoeuvres shown by the instructor. When considering the limitations of road cars, you won't believe what these giant machines can do, as you go up, over and across anything in your way. The 4x4 driving day will come to a close with a debrief from your instructor. 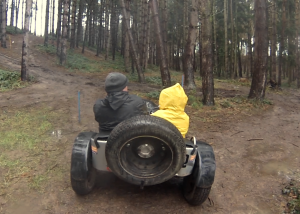 This 4x4 experience is available most Saturdays throughout the year and occasional weekdays on special request (minimum group size 3). 15 year old drivers must be joined by a paying adult driver. If you feel that your physique may impact upon your participation of this experience, please get in touch as there may well be an alternative substitute. 4x4 Driving Experience Kent will last for 1.5 hours, with around 20mins of actual driving time. Participants: The Kent Off Road 4x4 Driving Experience is for 1 participant. There may be up to 2 other people on the experience with you on the day. There is a small canteen with tea and coffee where spectators can watch some of the experience, but it is not possible to watch the entire duration. The centre will provide all necessary equipment, all you would need to bring is yourself dressed in casual clothes that you don't mind getting dirty - and soft soled shoes such as trainers. The most extreme of weather conditions may affect whether this course goes ahead. If in doubt, please call the centre on the day of your activity. A thoroughly enjoyable experience. Our instructor, Steve, was very knowledgeable and made the entire experience extremely enjoyable. I would not hesitate in recommending this to friends and colleagues. Paul is a great instructor and made the whole experience, for all four of us, fun and informative. He had each of us doing things with the cars we never would have believed possible. Many thanks from all of us for a hugely enjoyable day. Really loved this experience. Instructor was excellent. We would love to do it again. It was great, loved it. Can't wait to do it again! This was a birthday present from my lovely hubbie which I absolutely loved and enjoyed. The whole experience was well put together and the instructor was very good and gave me confidence. Not a problem having a passenger in the back but little worried about the other passenger who was a young boy who was obviously scared stiff! Would definitely recommend it though. Great experience, and hopefully will be doing another in the near future! This experience was a brilliant surprise for my partners 21st birthday! The instructor was really friendly and great throughout the experience. Would definitely recommend to others. Will be booking again! Thank you for a fantastic experience, everything was explained very well, also very friendly and welcoming to people that were not involved in the event, highly recommend! would recommend the day out to anyone who would like to try out something different. 'Discover 4x4 Driving' was really challenging. Ian was very good he explained things clearly and was humorous in his manner and made everyone welcome. 5 star guy. Very informative and good fun. 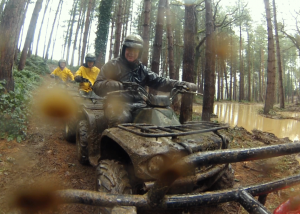 Although the weather was pretty gruesome; very wet, heavy rain we had a brilliant time. I had booked this as a 40th birthday gift for my friend but booked two sessions so that I could sit in with her. I did not intend, under any circumstances to do any driving just sit back and enjoy the experience as a back seat driver. However I ended up being talked into doing the same daring driving tasks as her. Pretty hairy but pleased I did it. Mud! mud's not the word. Great fun but not for wimps. The driving circuit was very dry so the experience was not that exciting, but you cannot make it rain. Certainly a very good experience. Maybe longer sessions in the driving seat would be better because we seemed to spend a lot of time swapping over. Do you need a full UK driving licence to participate in this activity? Under 16s must be accompanied by an adult, but a driving licence is not required as participants will be passengers in the 4x4. What 4x4 car will I get to drive? On this experience you will get to drive the Land Rover Discovery. Can I drive a Land Rover Defender on this experience in Kent? The venue has one Defender available on Saturdays only which must be pre-booked.